As we now know, waves seventy, eighty, even over a hundred feet high are real, and they are not unusual. Most people would want to avoid such waves as much as possible--waves much smaller than these monsters are dangerous and contain the potential for massive destruction, after all. Other people seek them out, and these are the folks Susan Casey meets in The Wave. Traveling with big wave surfers like Laird Hamilton, and talking to mariners and scientists, Casey investigates what we’ve learned and what we still don’t know about waves. Also, what we might need to worry about in the future, considering how much of the world's population lives near the ocean, how much stuff is transported in massive cargo ships across oceans, not to mention climate change. Casey blends firsthand experiences on the ocean with scientific research and historical accounts of big waves (the Lituya Bay chapter, in particular, is hair-raising) into one engrossing book. Although The Wave was published in 2010, prior to the tsunami that hit Japan in 2011--and I don't think it's possible to read it now without wondering how the book would be different had it been written post-Japan tsunami--it is very much still worth reading, especially if you're interested in the ocean. Or surfing. 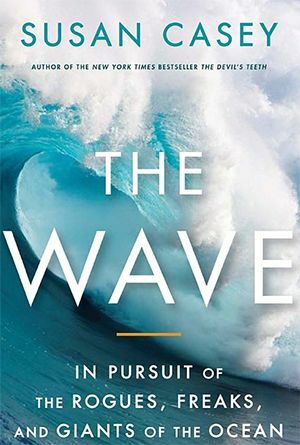 As one scientist tells Casey, “People have been studying waves for so many years, and we’re still struggling to understand how they work.” But Casey does a fine job of explaining is known to the rest of us, conveying the power and the beauty of the ocean's waves to readers of this book. If I've said it once, I've said it a million times: Don't judge a book by its cover. 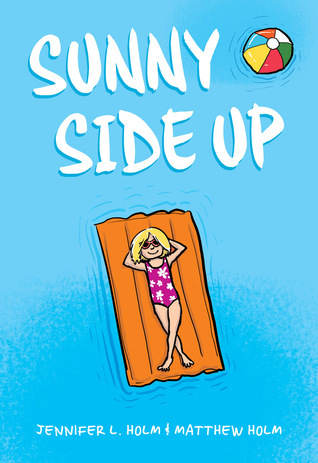 As fun as this cover is, the protagonist of this graphic novel is not the carefree, sunbathing type - in fact, she's almost the opposite of what you might assume by looking at the cover. So pick up this book and give it a try. I think you'll be pleasantly surprised! Sunny (real name: Sunshine) is spending the summer in Florida with her grandfather. It's the first time she's been away from her family for such a stretch of time, and hanging out with retired folks in Snoozeville is not exactly how she envisioned her summer. Luckily, her lively grandpa has lots of activities planned for them - like going to the grocery store! hanging out with the neighbors! eating dinner super early! His sunny disposition gives his granddaughter a newfound appreciation for the simple joys in life. Sunny also makes a friend in Buzz, a boy her age who introduces her to the wonderful world of comic books. Together they dream up fun and easy ways to help others and earn some pocket money. Throughout the story, flashbacks to the previous year reveal important things about Sunny's home life with her parents and two brothers. It's easy to keep track of the then and the now thanks to simple text tags with the month and year as well as a different haircut for Sunny - longer hair last year, shorter hair this year. The dialogue is simple and straightforward, allowing this to be a quick read for kids who naturally fly through books or a more contemplative journey for kids who really sink into the story and/or pay attention to the details in the illustrations. When Sunny discovers her grandfather is "trying" to quit smoking, it brings up a problem with another one of Sunny's relatives, forcing her to confront a family secret that's been bothering her for a while. Some books shy away from tackling issues like substance abuse and smoking in an effort to 'protect' young readers, but the truth is, kids are aware of these issues, especially if someone in their immediate family is battling addiction or similiar problems, and this book can potentially help kids deal with those in-house secrets and perhaps make them confident enough to broach the subject with their parents, teachers, or other trusted adults. Sometimes, it is easier to deal with something you're going through when you see it presented in a fictional setting, be it a book, a film, or a TV show. Those stories can encourage readers and viewers to ask for help or get closure (if possible) on something that's been hurting or haunting them. This is just as true for adults as it is for kids. This full-color graphic novel written by Jennifer L. Holm, illustrated by Matthew Holm, and colored by Lark Pien is a great fit for Scholastic's Graphix line. The bright colors in the Florida pictures really pop, while the panels and pages that feature comics are lovely tributes to both the superheroes and their enthusiastic fans. And how cool is it that Jennifer and Matthew are real-life siblings? This story about brothers and sisters and summers and secrets is recommended for kids in upper elementary school and middle school. Zeroboxing is mixed martial arts in a gravity free cube, and Carr Luka is the sport's newest and youngest superstar. 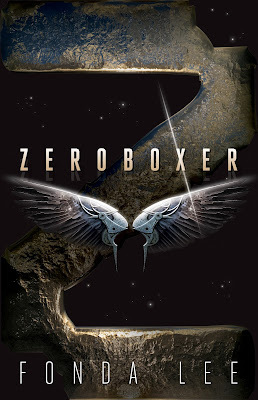 As a Terran (Earth born,) his fights are finally making the sport more popular with the residents of Earth and not just those on Mars, the moon or the other colonies in the solar system. As his career starts to really take off, Carr finds out some disturbing news about himself and he must decide if it will destroy him or make him even stronger. This story has some really great action coupled with deeper story lines surrounding genetic engineering, ethics and socio-economic class. John Scalzi is one of my favorite contemporary science fiction authors. His books are accessible but smart, funny but thought-provoking, quick reads but entirely re-readable. He's been compared favorably to Heinlein, albeit a feminist "version" rather than a chauvinistic one, and he is a well-respected if occasionally controversial member of the science fiction community. Near-future London has been devoured by riots. The culprits? Out of control teens labelled "feral" by the media and the police. Huge swaths of misbehaving students have been put on a new wonder drug called Concentr8. It's like Ritalin on steroids. Wait, that might be confusing, it's like Super-Ritalin. There, that's better. 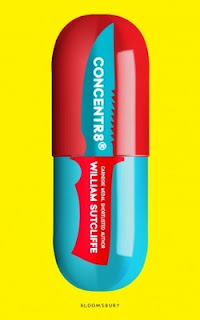 Concentr8 has been "proven" by the medical community, often backed by pharmaceutical companies, to reduce criminality in youth suffering from ADHD. Then, out of the blue, the program is stopped cold. The teens, suddenly deprived of their precious drug, go all Dee Snider and decide that they "Ain't Gonna Take It," hence the riots. The novel focuses on a young gang, although they wouldn't call themselves that. It's made up of Blaze, Troy, Lee, Femi & Karen. They've been on Concentr8 for many years and decide to wander out into the city and see if they can capitalize on the rioting. All through junior high and high school I was a member of a Boy Scout troop- A Sea Scout troop to be precise. We learned a lot about knots, basic navigation, clouds and we bonded through camps and other adventures. More than anything though, the life lessons have stuck with me all through life. There is something about leaving the confines of land in a small craft at the mercy of the elements that builds teamwork, character and camaraderie. Stormstruck is written by John Macfarlane, an ex-Navy serviceman. In it a headstrong boy called Sam determines to save his faithful pooch Pogo from a certain death by making a sea journey. As you would expect. things soon go awry and they have to help each other survive. There are other elements to the story as well- Sam constantly references the wise sayings of his older brother Steve and later in the novel we discover why. I remember reading The Rime of the Ancient Mariner in college and the line "twas water, water everywhere but not a drop to drink" has always stuck with me as being perhaps the worst thing about being lost at sea. The book is told in a first person viewpoint and on more than one occasion the search for water and his burning thirst are Sam's major predicaments. Macfarlane's knowledge of sea survival is astounding and he is able to transmit that through Sam's voice. Sam, for his part is a very capable young seaman. As you would expect there are lots of twists and turns in the story and just when we think he is safe some other calamity befalls him making for a compelling read indeed. This story has echoes of classic survival reads such as The Call of the Wild and The Old Man and the Sea but with a youthful exuberance of books such as Down the Yukon by Will Hobbs. I recommend it for ages 9+. For more reviews like this one check out my personal blog here. Narrated by the nine muses (who tell segments of Apollo's story), O'Connor introduces Apollo with stories of his origin and some of his adventures - like killing a giant python as a way of seeking revenge for a time when the serpent pursued his (and his twin Artemis's) mother during pregnancy. You can check two of the spreads related to that story line below. Like many of you, I spent some time over the holidays in a galaxy far, far away, swept up in the story of an epic war between rebel forces and an evil empire, a story filled with interstellar strife and futuristic technologies. 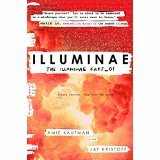 But I have yet to see the new Star Wars movie; instead, I read the pulsing Illuminae: The Illuminae Files_01 by Amie Kaufman and Jay Kristoff. Labels: dystopian , Fantasy , First Love , Science Fiction , War - What Is It Good For? Emily and Lucas only have one thing in common. They were both at the wrong place at the right time, and they both reacted in the same way. They chose to look the other way. The cover of A STEP TOWARD FALLING states, "Sometimes the worst thing you can do is nothing at all." That's what Emily did the night she saw Belinda under the bleachers. She knew something bad was happening, but when she saw Lucas was also watching, she made the decision to let him deal with it. Later, she learned that Lucas felt the same way, and no one stepped in to help the helpless Belinda. Emily and Lucas have the same punishment for their thoughtless inaction. They are required to put in volunteer time at the Life-Long Learning Center that serves adults with disabilities. Their assignment is a class called Boundaries and Relationships in which the young adults are given instruction on dating and other social interactions. It is quite an eye-opener for Emily and Lucas as they learn to work with disabled people just like Belinda. A few years ago, when my family returned to our urban home from a long spring vacation, we were greeted by a dozen or so young owls frolicking on the roof. Surprised and delighted, I couldn't help posting on facebook, "Either there's a nest nearby or one of the kids got accepted to Hogwarts." Harry Potter has become such a part of the cultural milieu that he springs instantly to mind every time a train arrives or an owl flutters by your window or an iPhone 6s snapshot moves a little bit. Sometimes it's hard to remember that Harry was neither the first nor last fictional wizard to struggle through a program of rigorous magical instruction. 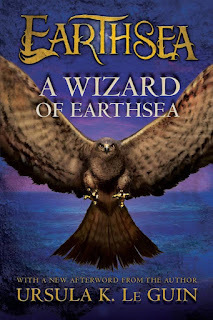 Take Ged, from A Wizard of Earthsea, published in 1967 by Ursula K. Le Guin.